Although my own experiences are indeed very small in comparison to many of my elder godbrothers and godsisters, I have decided to share a few here anyway just to help jumpstart our memories section which has been created for this purpose. Many devotees have memories and stories to tell, so hopefully, more will be inspired to participate in the near future. For me, the most prominent feature of Srila Prabhupada (especially in his personal presence) has always been his overwhelming compassion and love. Never have I seen or felt such incredible mercy. Even the simple act of receiving prasadam from his hand was filled with spiritual meaning and joy. prasadam. He gently but firmly pushed it in my hand, as if to say: "Here, take the mercy." When his soft lotus fingers touched the inside of my palm, I knew that I had (undeservedly) received a most wonderful benediction. Such an incident might not appear noteworthy to others; but for me, there was nothing more valuable. To receive a morsel from the hand of Krsna's pure devotee left nothing to be desired or attained in all the three worlds. Once during a Sunday feast program, I was performing arotik on the altar; and of course, after offering each article to the deities, I had to turn and offer them to Prabhupada's vyasasana. But this time, Srila Prabhupada was personally sitting on his vyasasana. Each time I turned to make Prabhupada's offering, I was overwhelmed with both happiness and a deep sense of unworthiness. "How did I manage to get here? ", I kept thinking. My mind was scattered in a thousand directions, yet Srila Prabhupada glowed serenely and transcendentally as I bumbled my way through it all. Every time that I looked at Prabhupada, it was like gazing through a window to the spiritual world. What causeless mercy indeed. Another time, Srila Prabhupada had just finished giving Srimad-Bhagavatam class. As he made his way up the stairs to his room, a group of us were enthusiastically chanting, "Jaya Prabhupada! Jaya Prabhupada!" The further Prabhupada climbed, the more intense and loud our chanting became. Finally at the top of the landing, Prabhupada turned around and smiled the most beautiful oceanic smile, illuminating the stairwell -- and our hearts -- with his pure spiritual effulgence. He then bowed his head and folded his hands in the traditional pranams gesture. To receive this simple and humble acknowledgment from Srila Prabhupada was the perfection of our lives. 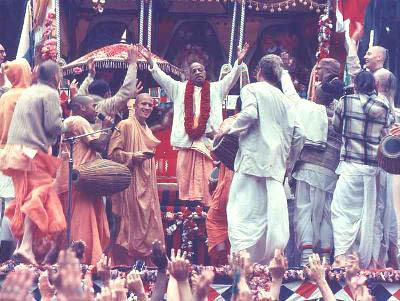 One of my favorite pastimes was Prabhupada's airport arrival lila, in which hundreds of devotees converged to greet and adore our triumphant leader and spiritual father. The energy and electricity coursing through the airport was just plain indescribable, but there was no doubt that we were in the presence of Krsna's dearmost servant. There was no better place to be in the universe, and we all felt so grateful and humbled to be there. In spite of the large crowds, the loving exchanges between Srila Prabhupada and his devotees were very sweet and intimate. Prabhupada's potency was unfathomable, but we all received a taste that was undoubtedly from beyond this world, by his grace. San Francisco Rathayatra was another one of my favorites. Pulling Lady Subadra's cart with Srila Prabhupada on board was as good as being in the spiritual world. I fondly remember the 1974 Rathayatra in particular, where Srila Prabhupada stood up and danced after throwing flowers to the audience (see above photo). I was fortunate enough to be standing near the front of the stage, and as Prabhupada danced, I was thinking that "Prabhupada is blessing everyone. Prabhupada is blessing the world." My hairs stood on end and shivers ran down my spine. Later, I managed to secure a portion of holy remnants from Prabhupada's plate (after much enthusiastic jostling with the crowds). Prasadam ki jaya! During the Mayapur/Vrindavan festivals every year, the devotees were most fortunate to see and hear Srila Prabhupada every day throughout the festival in both of the holy dhamas. I remember taking great pleasure in the bell ringing pastime in Mayapur. Prabhupada would circumambulate the temple room, stopping to ring each of the two bells on either side of the room. As Prabhupada pulled the rope ("ding ding ding"), the devotees chanted and danced in ecstasy like eager bumblebees hovering around the supreme flower of all flowers. Whether it was sitting with him at darsan, watching him bow down and greet the deities, hearing his classes, going with him on morning walks, or bowing at his lotus feet, it was all pure unadulterated bliss. Srila Prabhupada was our lord and master, and there was no mistaking it. Wherever Prabhupada traveled, he distributed his love and compassion freely. In his divine presence, the mercy flowed like nectar from the gods. Thankfully, that mercy is still available to everyone.